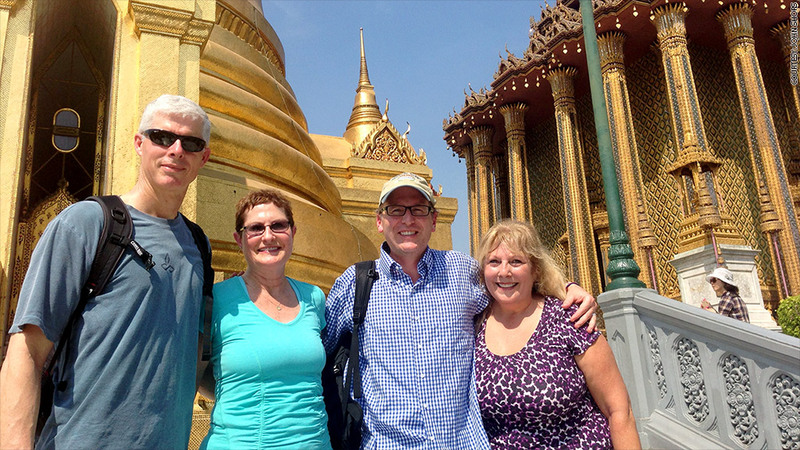 Author John Shors (second from right) with a group of readers in front of a Bangkok temple. Bestselling author John Shors offers readers more than literary imagery of his novels' settings. He actually takes them there. He leads tours of the Southeast Asian temples and hidden jungles that inspired his books. The idea: Get people excited about his work, and sell books -- a lot of them. Today's authors don't always lock themselves away for two years to write. Tighter publisher budgets, fewer booksellers, more competition and the rise of ebooks has put more pressure on novelists to aggressively market their books. Writers now travel with readers, Skype with book clubs, create products based on fictional characters and produce online trailers. Competition is fierce: An estimated 301,642 books were published in 2012 alone, almost 100,000 more than in 2002, according to Bowker Market Research. "Every author feels this pressure and thinks, 'How can I make my book stand out?'" says M.J. Rose, author of 14 suspense novels. Traditional publishers often provide just a few thousand dollars for marketing, which means much of the responsibility falls on authors. Yet authors reap just a small amount from book sales -- about 15%, which about $1 to $2 per book. To boost buzz for her novels, Rose hired an Etsy artist for $350 to make necklaces like those featured on the covers of her recent books "The Collector of Dying Breaths" and "Seduction." And she asked New York perfumer Frederick Bouchardy to create a fragrance based on a fictional character, whose Parisian family was perfume makers. "I was lucky that Frederick fell in love with the book and the idea of creating a perfume for my character," says Rose, who invested nothing and draws no royalties from the sales. Bouchardy sells the perfume online and in designer boutiques across the country. Rose buys $28 bottles to give away at promotional events. The creativity paid off: Rose has sold more than a million copies of her books. In February, he took a dozen readers on an 11-day tour to Thailand and Cambodia locations that inspired two of his novels. He has two more Asia trips set for this year and next. By traveling with a few dozen readers, Shors hopes to build loyal fans who spur word-of-mouth buzz. Plus, the 11-day trips, which cost nearly $6,000 per person, offer extra income at a time when many authors need second jobs. "It gets people excited," says Shors, who has spoken to 3,000 book clubs over the past decade. "If it wasn't for these programs, I would have sold a fraction of the books I've sold." Thriller writer Steve Berry took a similar tack, traveling with 25 readers last fall through Prague and Vienna to discuss his book "The Columbus Affair." Next year, he'll go to Southern France with readers of "The Templar Legacy." Meanwhile, Maryland author Melissa Foster boosted her book sales with a supercharged production schedule, publishing one book a month since the start of 2013 and releasing some as free ebooks. It's made her a New York Times bestselling author who draws six-figure sales each month from her 18 books. Foster works with a six-person editorial team to finalize drafts and says she once rewrote a 300-page novel because she didn't feel it captured the essence of her main character. "I don't just rush through books," she says. "I'm feeding my own obsession, since nothing outside of my family makes me as happy as writing." Foster says authors who get to know readers in book clubs and on social media will have an edge. "Book sales are not about selling, they're about building relationships," she says. "People talk. People read. Put the two together, and there's your answer to getting noticed."